The remarks come as anti-poverty advocates denounced the government's decision to scrap the project while the province defended the move Wednesday by suggesting the program discouraged participants from finding work. 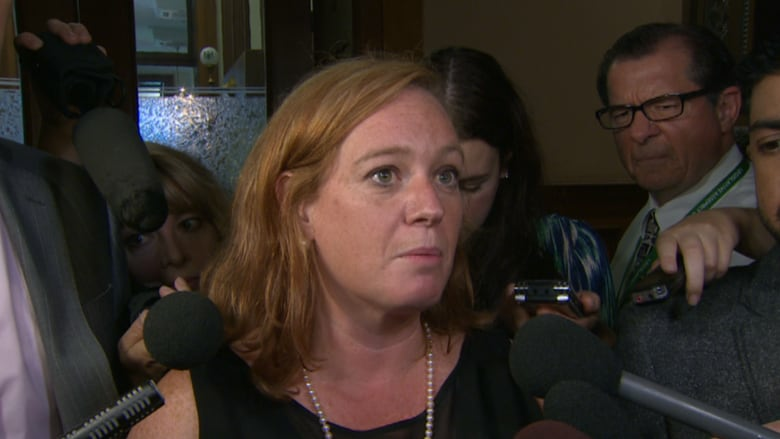 Though the Progressive Conservatives had promised to preserve the pilot project, MacLeod said the government reversed course after hearing from ministry staff that the program didn't help people become "independent contributors to the economy. "It really is a disincentive to get people back on track," she said Wednesday. "When you're encouraging people to accept money without strings attached, it really doesn't send the message that I think our ministry and our government wants to send. We want to get people back on track and be productive members of society where that's possible." A source involved in the pilot, however, said it had not been active long enough to generate the data required to gauge its success. The government announced Tuesday it was "winding down" the project and cutting a planned three per cent increase in social assistance to 1.5 per cent — the first steps in its plan to revamp the social assistance system. The basic income pilot project, which launched last year and was set to run for three years, provided payments to 4,000 low-income people in communities including Hamilton, Brantford, Thunder Bay and Lindsay. Single participants receive up to $16,989 a year while couples receive up to $24,027, less 50 per cent of any earned income. Statistics released by the previous government showed two thirds of those enrolled had a job. News of the project's cancellation stunned anti-poverty groups and those who received support through the initiative, some of whom said they'd be left scrambling to make up for income they had counted on in making future plans. Jody Dean, a Hamilton resident who participated in the program, said the financial stability granted by the project allowed her to go back to school part-time and to buy parking passes to the hospital where one of her three children receives care. It also relieved a lot of the stress that comes from struggling to make ends meet, she said. "I knew it was coming every month," she said. Now, the family will have to go back to living day-to-day, Dean said, adding she won't be able to enrol in fall classes. She called the minister's comments "ridiculous," saying everyone she knows on the program has done better because of it. "I know several girls that are working poor who have walked to work because they couldn't afford the bus. Did they quit their jobs because they got basic income? Hell, no," she said. "Another is still working her job but now it allows her the freedom to take the bus instead of walking an hour and a half. She may lose her housing now." "It's reprehensible, reprehensibly irresponsible to announce the end of the pilot without thinking those things through about how they're going to wind up the program and how they are going to support people," he said. people who have huge stresses in their lives now." The Ontario Coalition Against Poverty, which had been critical of the project, said cancelling it only a year in "demonstrates a reckless disregard for the lives of nearly 4,000 people… who planned their lives on the assurance of having a set income for three years." The group predicted the government's pledge to reform social assistance was nothing but a thinly veiled return to cuts brought in by former Tory premier Mike Harris, and vowed to oppose what it called Premier Doug Ford's "war on the poor."